The Irish Government itself now seems divided as to whether or not Ireland will require an embarrassing second bailout from the European Union, European Central Bank and International Monetary Fund. Although it’s only been a few days since Prime Minister Enday Kenny vehemently ruled out the possibility of that happening on a State visit to London, Social Protection Minister Joan Burton has once thrown a spanner into the works by claiming that the possibility of Ireland having to have recourse to a second bite at the institutions’ bailout fund hinges largely on the stability of the Eurozone as a whole, and the resolution of the sovereign debt crisis. "I can't predict the future. If you are asking me to crystal-ball gaze to the end of next week, I can't," Burton told the Sunday Independent. The minister said the deepening crisis in Europe had "significantly added" to the difficulty faced by Ireland in emerging from the EU/ECB/IMFprogramme in 2013, according to the interview with the popular Sunday newspaper. However Burton said that if the debt crisis were to resolve itself, then Ireland may be able to emerge from the programme on schedule. "If the eurozone comes together then we can work to the other side of the crisis and that would be of great benefit to Ireland, who could then leave the programme in an orderly fashion," the Minister said. Chief executive of the National Treasury Management Agency (NTMA) John Corrigan had more or less the same to say on the possibility of a second Bailout coming Ireland’s way. "When we meet potential investors, we don't get that many questions about the Irish situation; it tends to be more about the euro itself, or the wider European picture,” Corrigan told the Irish Independent. "US investors don't know what to think about European policy at the moment, and the shifts on things like private sector losses on Greek debt. Some in the financial services industry, however, have expressed their view that a second bailout would actually be in Ireland’s best interests. 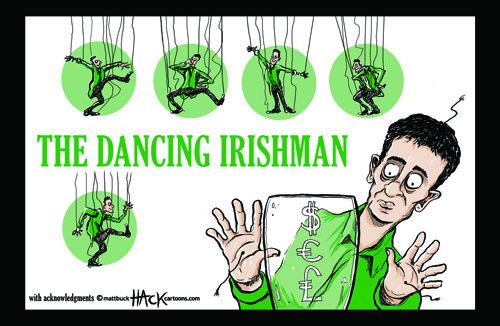 “Willem Buiter of international financial services giant, Citi, said instead of returning to the debt markets and borrowing money at a rate of 8%, Ireland should consider continuing borrowing from the troika at a rate of 3%,” the Irish Examiner reported earlier this week. Buiter also believed that that 2012 will see "downgrades for most, likely all EU/Eurozone triple-A economies" despite Ireland having survived the latest round of downgrades from Standards and Poor, maintaining its BBB+ rating. The European Commission, however, hit back at Buiter, saying that speculation of a second bailout ‘wasn’t helpful’ at the current time. Amadeu Altafaj, spokesman for Commissioner Olli Rehn told a daily news briefing that the talk wasn’t helpful according to the RTÉ website. "It is not particularly useful to open a public debate on a successor programme when the first programme is delivering," he told the European Commission's daily news briefing, RTÉ.ie reported. "It's ludicrous to be talking about a second bailout," the country’s Finance Minister told the Independent a few days ago. “So it’s really speculation by economists who at the start of the year speculate on these matters,” the Minister claimed.